As you may have heard, Defra announced on Wednesday (19 December) that all outdoor uses of metaldehyde are to be banned as of Spring 2020. We understand that this is very disappointing news for the industry and the decision could potentially have a large impact on your business. The decision follows advice to government from the UK Expert Committee on Pesticides (ECP) and Health and Safety Executive (HSE) that metaldehyde poses an unacceptable risk to birds and mammals. The ban is not because metaldehyde has been polluting drinking water sources. Although the ban has been announced this week, there remains a use-up period. This will be 6 months for the distributors to sell remaining stock and a further 12 months for farms to use up any product left on farm. We would like to encourage you to continue with stewardship and best practice over the next 18 months and please consider water protection if you need to use metaldehyde based pellets. In preparation for the phasing out of metaldehyde over the next 18 months, consider reducing your reliance on chemical control measures by adopting a wider range of options in your Integrated Pest Management (IPM) programme to control slug numbers. If you need to use chemical control, please use ferric phosphate-based pellets instead of metaldehyde pellets and, as always, follow best practice guidelines. In some areas there are water company funded initiatives available to support you, so contact your local water company to find out more. Please note that contact details can be found at the bottom of this update. Metaldehyde concentrations have remained below the drinking water standard at all 12 sites this week. 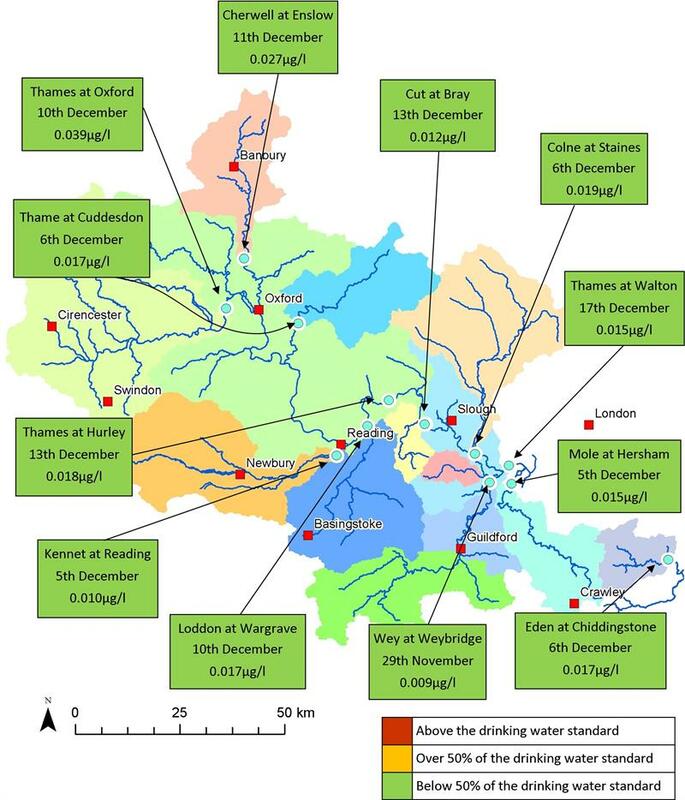 More prevalent rainfall over the last week has meant that soils will now be approaching saturation in many places across the catchment and therefore any further rainfall in the coming weeks could readily mobilise recent metaldehyde applications via runoff. If you need to make any further slug pellet applications this autumn please consider water protection, and as always, follow best practice guidelines (www.getpelletwise.co.uk). The River Wey joins the River Thames at Weybridge. Just before it’s confluence with the River Thames, water samples are collected and analysed for metaldehyde. 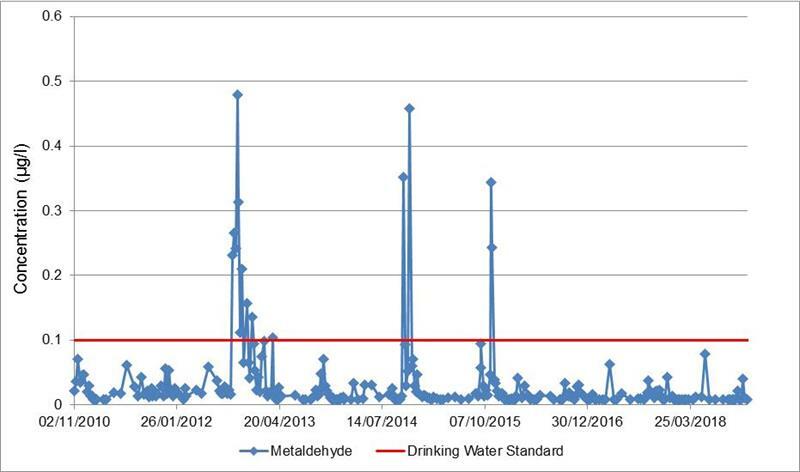 Metaldehyde concentrations have exceeded the drinking water standard 14 times since monitoring began in 2010, with a maximum concentration of 0.479µg/l in autumn 2012. In autumn 2016, 2017, and so far this season, concentrations have remained below the drinking water standard. A peak of 0.078µg/l was recorded in May 2018 following rainfall. It is possible that a lack of dilution due to low river levels had a part to play in the result observed.